In Krakow, one will easily find many unusual and original soups, and the so-called White Borsch is one of them. This cream soup cooked on a basis of fermented rye is very popular with locals. Sometimes it contains potatoes. White Borsch is served with sour cream that adds the signature white color to the soup. Flaki or Tripe soup is way more hearty and nutritious. It is cooked with beef broth and various vegetables. It would be a mistake not to mention Zurek soup that also contains fermented rye. Sausage, seasonal vegetables, and eggs are among the signature ingredients of this soup. As a rule, national cuisine restaurants serve this soup in a bread loaf. When it comes to second-course dishes, Pierogi are certainly among the most unusual ones. Pierogi are dough dumplings with various fillings, but unlike usual dumplings, Pierogi are not cooked in boiled water but roasted in a pan with a bit of oil. The fillings are usually the same as the traditional dumpling fillings, but mashed potatoes with fried onion remain the most popular variety. National meat dishes are a true pride of Krakow. This is the home city of the internationally famous Krakowska. The secret of its exceptional taste is in the cooking method – the sausage is first smoked and then fried. Golonka is another popular dish that is available in the majority of restaurants specializing in the national cuisine. Golonka is the Polish term for the roasted pork knuckle that is previously baked on a slow fire in an oven. The knuckle is baked with beer, so the meat becomes tender and juicy inside and crispy outside. Freshly baked pastries remain the most popular dessert that Krakow residents enjoy ordering. Knedliki with poppy seeds are very widespread in Poland, as well as a fragrant flat cake that locals call Mazurek. Local cafes offer various sweet rolls and pies with nut fillings. In order to search for new gastronomic delights, many tourists prefer to head to the main market in Krakow - Hala Targowa. Farmers and local manufacturers of the region come to this large market to offer their best and most delicious products. Visitors can try and purchase the most popular types of Polish sausages, cheese, fresh pastries, and various sweets. There are also several food carts that offer popular local fast food. It is a great place to try the popular Zapiekanki baguettes with various fillings and meat cooked on an open fire. This guide to cuisine and restauraunt in Krakow is protected by the copyright law. You can re-publish this content with mandatory attribution: direct and active hyperlink to www.orangesmile.com. 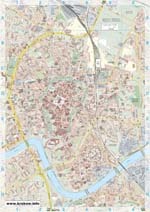 Travel notes on best cuisine and restaurants of Krakow (Poland) on OrangeSmile.com. Famous recipes and traditional dishes and courses in Krakow restaurants. Where to eat - our recommendations on popular places in Krakow, where you can taste delicious meal and also spend a good time with your friends.